Yes, it's still freeware. Think of it as a patch. I'm still committed to updating this version by fixing any bugs that I find, or tweaking this and that with improvements. It won't have as many features as upcoming versions, but I don't intend to abandon it either. An indenting bug was fixed for Select Case constructs when working with Projects and Modules. I also improved the indenting of Add Line Numbers code. When adding the date and time to text files being exported, the code has been adjusted to show the correct time. I made a change to the Copy Code and Compare Code userforms. Sometimes duplicate file names were showing. 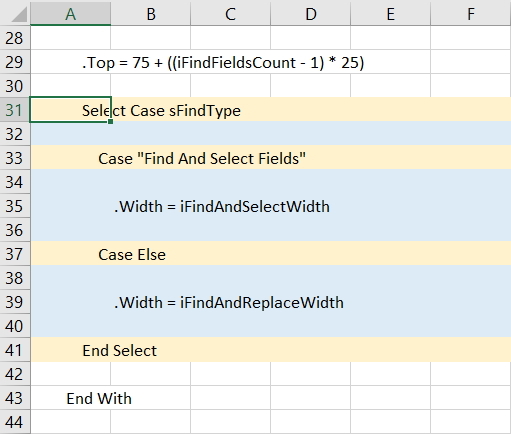 I edited Highlight Code In Excel so that individual Case statements are also highlighted with Select Case constructs. Note: It is a big help to see them highlighted this way. Unfortunately I had to hard code that part, so it will only work if your tab settings are set to 4. (In the VBE, Tools, Options, Editor, Tab Width). If I find a way to determine this programatically, I will adjust the code to suit. 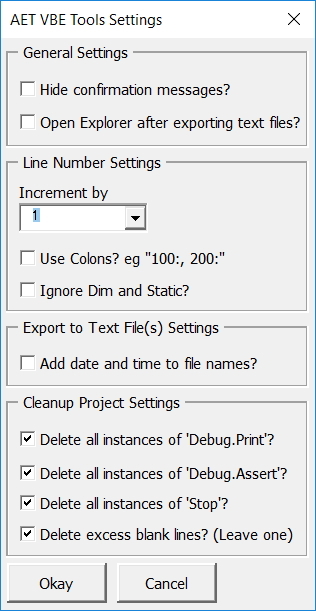 As a small bonus, I also added the functionality to delete Debug.Assert and Stop to the Cleanup Project code. The option to cleanup 'Stop" and 'Debug.Assert' instances is a great addition. Great to hear you like it. I really appreciate your support. Your tool has been presented to me and some friends in the workplace by Kellsens (from the comment above), and I must say thank you. I haven't tested all of the functionalities, but what I've seen so far is very helpful! Thanks Álvaro! It's good to hear such positive feedback!